An ESL lesson plan for teaching prepositions of time to intermediate level students. Feel free to use these ideas your classes and If you use an iOS or Android device, don't forget that you can get offline access to these materials through the TEFL Handbook app. 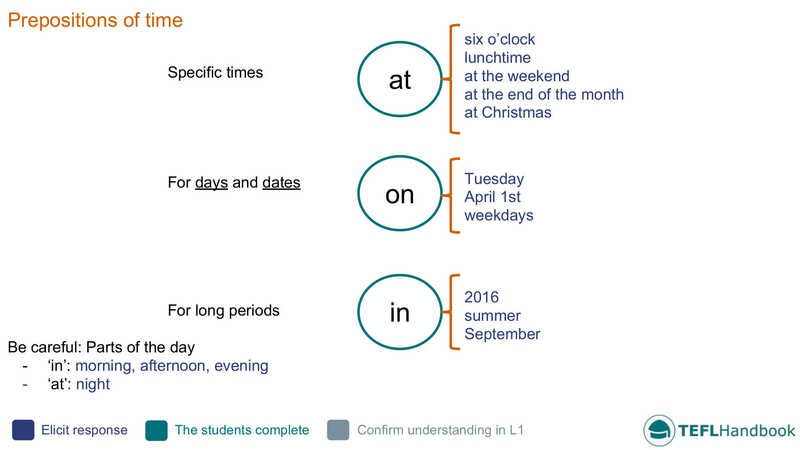 This ESL sample board can be used to highlight the usage of the prepositions of time in, at and on. Students at this level will be aware of these prepositions, but some will still get confused with their use. Therefore, the board serves as a nice lead-in activity that should get your students on the same page. The text in blue suggests opportunities to elicit responses. Friday evening, September, yesterday morning, Christmas day, summer, midday, the 8th of September, tomorrow, the 15th century, the afternoon, Easter, tomorrow evening, the morning, lunchtime, 1981, half past seven, next year. Students will work in pairs to populate the table with the above expressions. Teacher: What time do you get up on weekdays? Student: I usually get up at 7:45. Teacher: What about at the weekend? Student: A lot later, normally at 11 o’clock. For this speaking activity, students will take turns interviewing each other about what they did yesterday. They should talk about each part of the day and use times where appropriate. The person who is interviewing should be encouraged to ask follow-up questions. Demo this with a stronger student first. During the interviews, you should monitor for the correct usage of prepositions of time, frequency adverbs and the past simple. Our game ideas are suitable for low-resource classrooms, so all you'll need is whiteboard, markers and some students. For this fun ESL game idea, students will need a small blank piece of paper, about half the size of an A4 sheet. Divide the class into two teams in a manner where no team member is sitting next to another. Assign each student a time expression and tell them to write it in the corner of one side and their name in another corner on that same side. The students then turn over the paper and write a sentence that is true for them using the given time expression. The should write about something that they did or will be doing at that time and they must keep it secret. Once they have finished writing, have them turn over the paper again and inform them that they will have two minutes to draw a picture that represents their sentence. To give you a few more lesson planning options, here are some links to free online resources for teaching prepositions of time. The Prepositions of time (on, in, at) and PREPOSITIONS OF TIME worksheets at islcollective are fantastic for revising this topic. For an alternative approach on how to present this subject, check out How to Teach Prepositions of Time by Tara Arnsten at busyteacher. Also, there's a great collection of EFL - ESL activities for teaching time prepositions at teach-this.com. Most of these are geared toward elementary level learners, but there are a couple at the pre-intermediate level that look like they could be fun to try. 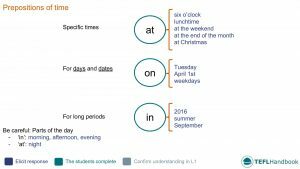 If you have access to video in your classroom, have a look at the Brittish Council's video on prepositions of time. It should work fine for both teenage and adult learners. You may want to prepare a few comprehension questions beforehand. Also, the video below by Wall Street English Indonesia could serve as a fun warm up, before you start into the board-work. We hope that you were able to grab a few ideas from this lesson plan. Our suggested next lesson is on the present tenses. Be sure to check out our complete collection of intermediate level lesson plans. For other levels, have a look at our entire collection of ESL lesson plans. Also, if you are an iOS or Android user, the best way to view this content is through the TEFL Handbook app. An ESL lesson planner for English teachers, designed for in-class use.